Why is the Day of the Apostle Santiago celebrated on July 25? The figure around which the Camino de Santiago emerges is also the pattern of Spain and Galicia. This day is festive in the Galician community, but not in the whole country. Since when is James the Apostle the patron saint of Spain? Since when is the Day of Galicia celebrated every 25th of July? On July 25 every year is celebrated the Day of Galicia and the Feast of the Apostle Santiago, a celebration that takes place in multiple Spanish locations and points from around the world. However, since the end of the dictatorship in Spain, the Day of the Apostle is not festive throughout the country, but only in the autonomous communities that decide each year in setting their calendar of festivals, with the exception of Galicia, which Celebrates its big day, so it is festive every year. The Apostle Santiago is one of the most important figures of Christian saints and legend around which arises the phenomenon of pilgrimage of the Way of Santiago more than a thousand years ago in the north of the Peninsula. After the supposed discovery of the tomb where rests rested, around the year 813, numerous Christians of the north of the geography began to peregrinate to what today is Santiago de Compostela to show its devotion. This custom became a tradition, expanding the phenomenon of the Camino de Santiago to all of Europe, so that the holy city became one of the most important centers of pilgrimage in Christendom, along with Rome and Jerusalem. The importance of the Way, the figure of James the Apostle and the city itself as a center of pilgrimage led in 1122 to Pope Calixto II decided to implant the Holy Year Compostela, held every year in July 25 fell on Sunday. In each Holy Year or Xacobeo (celebrated 14 times each century) indulgences are granted to all those pilgrims who in Santiago de Compostela meet the requirements of visiting the cathedral, receive the sacraments and pray a prayer. Although from the ninth century the kings of the reconquest recognized Santiago Apostle as their patron, it was not until the seventeenth century when the patronage of Spain was granted to the saint. It was by the work of Pope Urban VIII that it seems that under pressure from the Compostelan clergy in 1630 he decided under the reign of Philip IV that the apostle James the Greater was officially recognized as the sole patron of Spain (which, since 1627, Jesus). 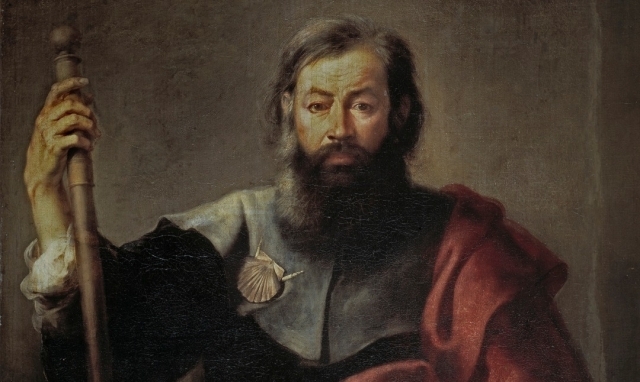 This decision was made jointly with the recognition by the Church that its remains were buried in Compostela and also stating that the feast of St. James the Apostle will be celebrated every 25 July. Since 1646, by the work of Philip IV, the Voto de Santiago has been institutionalized, following the tradition of the Christian kings of the north of the peninsula in the times of the Reconquest, giving an offering by kings, princes and the archbishop of Compostela to the Church of Santiago every July 25th. This offering continues to take place today, though symbolically, in the celebration of the Mass on the Day of the Apostle. The celebration of the Day of Galicia, National Day of Galicia or Día de Patria Galega every July 25th, coinciding with the Day of the Apostle, is an initiative that emerges in a meeting of Irmandades da Fala in 1919, a Galician cultural and political grouping of Nationalistic character, which determines that this festival is celebrated every year from 1920. During the Franco dictatorship, the celebration is prohibited, which goes underground and is celebrated by the Galician emigrants abroad; It is not until 1979, by decree of the Xunta de Galicia, when it is established as an official holiday of the Autonomous Community of Galicia.